“Screening candidates to find those likely to show high versus low levels of employee engagement doesn’t follow a simple ‘more is better’ screening model,” says Dr. David Jones. Jones described how the HirePayoff™ online employment test’s Eager to Engage scale predicts both employee engagement and on-the-job performance. “Bottom line, why wouldn’t an HR leader add the concept of finding engaged employees to the hiring process? Why focus resources only on growing engagement?” asked Jones. HR leaders and employment testing professionals have reached out for details about the qualities that identify candidates most likely to bring employee engagement to the job. “This is where field research, data analytics, and psychometrics we used to create the Eager to Engage scale come to play, and where the complexities we found come to light,” says Jones. “It’s also where predicting a candidate’s level of engagement departs from typical candidate assessment models,” Jones adds. For example, most candidate screening is driven by a ‘more is better’ model… more drive and achievement orientation lead to better sales… more troubleshooting and mechanical skills lead to better plant maintenance… more interpersonal orientation and flexibility lead to better customer service, etc. ‘More is better’ is a classic way to screen candidates for a job. Under a ‘more is better’ model, assessment tools simply seek those who achieve higher scores, typically setting a qualifying standard candidates need to meet before proceeding in the hiring process. Sometimes, even rank-ordering candidates on assessment results further applies the ‘more is better’ model. “In creating the Eager to Engage scale we found a different model,” says Jones. “We found the qualities predicting employee engagement don’t follow a simple, ‘more is better’ model. Instead, you need to view different qualities to exclude candidates likely to be disengaged, than to find those likely to be highly engaged,” adds Jones. In our work, statistical analyses showed the HirePayoff™ tool’s work-focused dimensions – Drive to Succeed and Work Ethic – carried nearly three times the weight as its relationship-focused dimensions – Team Play and People Focus – in identifying those who turned out to be disengaged employees. “Low scores here identified low levels of engagement, even if the candidate scored high on Team Play and People Focus,” says Jones. “More interesting was the finding about how to identify highly engaged employees. Here, the coin flipped,” says Jones. Work showed that distinguishing highly engaged employees placed nearly two times as much weight on Team Play and People Focus qualities than on Drive to Succeed and Work Ethic… essentially, the reverse of what defined identifying disengaged employees. How to screen candidates follows more of a ‘multiple hurdles’ model. “Lack work ethic and a drive to succeed, and all is lost; the employee is very likely to be disengaged. Bring the right level of work ethic and drive, plus a focus on people and team play, and the individual is likely to hit the top of the engagement scale,” says Jones. Findings of this deep-level research shaped the Eager to Engage scale of the HirePayoff™ employment testing tool; a tool that drives predicting employee engagement, as well as candidate’ on-the-job performance and advancement potential. 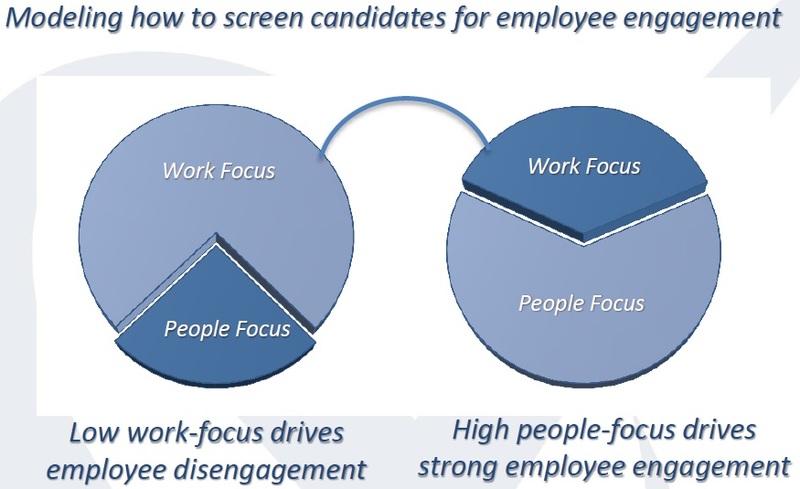 “Screening candidates for employee engagement requires looking through two lenses,” says Jones. “Want to avoid those likely to be disengaged? Screen them through the lens on the left. Want to find those likely to be highly engaged? Screen them through the lens on the right. Want both? Look through both lenses; that’s what Eager to Engage is designed to do. When the analyses described were carried to a completely different group of employees, the same results was found. In effect, the Eager to Engage assessment strategy was ‘cross-validated’. In addition, when scores on the Eager to Engage scale were used to forecast which employees in a group of over 800 retail workers would fall in disengaged vs. highly engaged categories, results showed 83 percent accuracy. “There are lots of opinions about what shapes employee engagement,” says Jones. “What we’ve found is not opinion, it’s data-driven fact, replicated across different settings and employee groups. And it suggests that finding engaged employees adds to the payoff in growing engagement once people are hired. That’s what we’re now setting out to explore further,” adds Jones. David Jones, PhD, author of Million-Dollar Hire: Building Your Bottom Line, One Employee at a Time, published in April, 2011 by Jossey-Bass, is among the few Business Psychology professionals to found and grow a major international consulting and HR recruitment and selection process outsourcing business. In Million-Dollar Hire he explains how, even in a slow economy, U.S. employers make millions of hiring decisions every month… and in today’s demanding environment, companies no longer have room to get it wrong. Every hire is an investment… every decision carries risk. Done well, every one can pay a return. Using practical, real world illustrations, Jones uses the book to show there are tools that help treat every hiring decision with the same focus a business follows in acquiring other high-value assets. Founder and CEO of HRStrategies, a firm listed among the fastest growing consulting companies in the U.S. prior to its acquisition by today’s Aon-Hewitt, Jones designed and implemented employment testing programs for a majority of the Fortune 100, as well as startups, expansions, and public sector agencies. Today, Jones is president of Growth Ventures Inc., whose HirePayoff™ division works with employers to tap candidates’ ‘Can Do Will Do’ competencies. Through HirePayoff™, Jones helps companies re-invent their online recruiting and hiring process. The target – find new hires with employee engagement, strong sales performance, solid employee retention, and bottom-line drive. All the HirePayoff™ online recruitment and selection tools are supported by sound test validation and uniquely driven by Six Sigma continuous improvement. For more information, visit www.hirepayoff.com.